PLEASE DO NOT UPLOAD PHOTOGRAPHS FROM TAKERU'S BLOG OR MAGAZINE SCANS, ECT. It is actually against dA rules to do this and counts as copyright infringement. Also, don't upload images that you're only messed about with the hue or contrast or added a photoshop filter to. This is NOT art. Also we do NOT accept photo edits unless the photo's are edited into an icon or wallpaper. 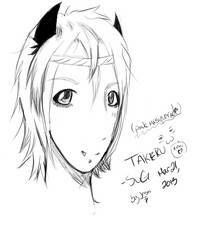 This is a group for everyone who loves Takeru from SuG. We accept all forms of art! From Fanfiction to Fanart, Cosplay to Wallpapers. Join requests are automatically approved. place of birth: Saitama prefecture, close to the border of Gunma. celebrity: doesn't watch TV, so doesn't really know any. Has an older brother and a younger sister. Was a proper student until high school. Has a grand imagination and masters the secret ability of dropping cell phones into toilets by accident. Doesn't get along with computers. Has depersonalization disorder, panic attacks, and has suffered of autonomic ataxia since 14. Has been in a car accident. Considers himself a genius, and frequently reminds people of how hyper sadistic he is. Has the bad habit of snapping his teeth together after yawning. Fashionista; frequents Kera shoots. Has known Shinpei since high school. As a child he used to visit the granny living next door, asking for breakfast, wearing yellow boots. Does his best to avoid answering biased questions about whether he and Chiyu are in fact lovers. Speaks perverted things openly in public without showing any signs of embarrassment. Better Late Than NeverThere were only so many 'original' presents to give. Especially at Christmas. Sadly, many of those so called 'original' ideas were actually very cliched. Especially between lovers. Add onto the fact that the man trying to think of something was rather childish and unimaginative when it came to romantic areas, he found himself screwed. Takeru sighed falling face down on the couch, his mop of blond hair standing on end in a mess. His overly large pajamas swamped around him as he burrowed into the cushions. He closed his eyes, his fingers twitching beneath himself as he fidgeted with his pajama top. He sucked his bottom lip between his teeth, worrying it slightly as he tried to think of something...anything. He needed an idea; he couldn't make Chiyu wait forever. "Masato!" Takeru screamed. Ruki and Kaede held Takeru back. Miyavi's eyes had watered. Miyavi kissed Masato on the forehead. "Goodbye, my angel." "NO!!" Takeru screamed and squirmed to get away from Ruki's and Kaede's grasp. "Let me go! Let me go! “Takeru yelled. Miyavi released his hold on Masato and Masato fell to the floor. Miyavi looked up to the three vampires then he vanished. Ruki and Kaede let Takeru go. Takeru ran towards his bloodied lover. "No...no, no, no! Masato, you stay with me! Please!" Takeru begged as he held Masato close. Ruki ran to the other side of Masato. "He can still be saved, but you must do it fast before death consumes him." Takeru looked down at Masato. Masato had a smile on his face. "Masato, remember when I asked you if you ever wanted to become like me. What is your answer?" "Takeru!" Kaede called. Kaede and Ruki had been running away from the guards that held silver in their hands a shield that protected them from getting killed. They spotted Takeru while running away. “Have you seen him? Have you seen Miyavi?" Takeru shook Kaede. "Calm down, Takeru," Ruki said. "Kaede is still recovering from that gun shot." "It's ok, Ruki" Kaede said. "We haven't seen him. Did you find Masato? or Shinpei?" Takeru gulped. "Chiyu found Shinpei and Masato. I was about to save Masato when Miyavi took him from me." "We'll help look for him." Ruki said. Kaede and Ruki had split up. Masato kept glaring at Miyavi. Miyavi left the palace grounds and ended up taking Masato to some random building somewhere far from the palace. "Is running all you can do?" Masato asked. Masato rolled his eyes. "Why do this, Miyavi? Why hurt others? Weren't you once human yourself? What happened to those human emotions?" SuG's new single is entitled sweeToxic and will be out September 19. May 11, 2011 Sorry for the lack of updates! I know this doesn't really have anything to do with artwork, but I just want to spead the word so that hopefully lots of SuG fans will be able to enjoy reading it! hi~i'm Chinese and like the J-POP ! maybe cant speak English well. [link] its from my second dA acount I would love to see it in the group!! hey! 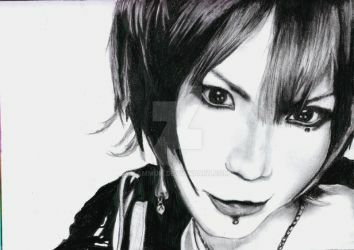 if anyof you have a facebook i made a group for SuG please join!